In the time leading up to surgery, your doctor might ask you to make small modifications to your lifestyle to help maximize your health and the success of the surgery. For example, your doctor might request that you stop taking vitamins and other supplements in the weeks before surgery. The reasons for this depend on your particular health conditions and the supplements you take -- ask your doctor if you're unsure why you're being asked to do so. One reason your doctor might ask you to stop taking vitamins before surgery is the risk of drug interactions. During and after your surgery, you might receive a number of medications, such as anesthesia, pain medication and antibiotics. Certain vitamins might alter the efficacy of these medications. For example, vitamin B-6 can interfere with the function of specific antibiotics, so taking vitamin supplements might increase your risk of infection after surgery. Your doctor might ask you not to take vitamins before surgery due to some vitamins' effects on bleeding and blood clotting. For example, vitamin E can increase your risk of bleeding if consumed in large doses. 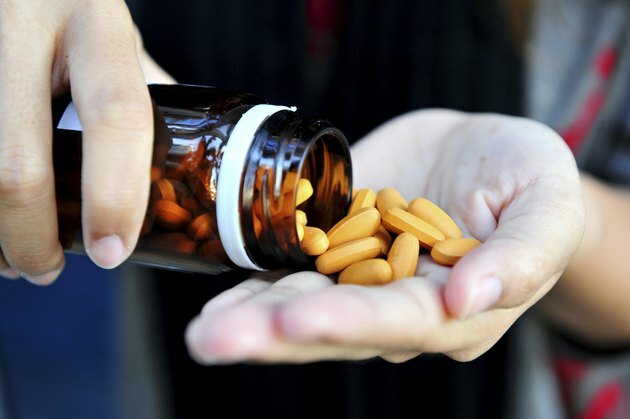 Refraining from vitamin supplements before surgery helps ensure you will not have abnormally high levels of vitamin E and can help with your healing process. Another reason your doctor might ask you to stop taking vitamins before surgery is to reduce uncertainty about what exactly it is that you're taking. Different supplements contain added ingredients, which could potentially interact with medication or affect your body's reaction to surgery. Your doctor has no real way to know which added compounds and extracts are present in your body due to your supplement usage. When your doctor asks you about any drugs you're taking, be sure to give her information that includes any over-the-counter drugs, as well as vitamins and other supplements. You might even want to open a conversation with her about whether you need vitamin supplements at all: an article published in 2013 in the "Annals of Internal Medicine" came to the conclusion that "supplementing the diet of well-nourished adults with (most) mineral or vitamin supplements has no clear benefit and might even be harmful." Good communication is an important part of maximizing your health.